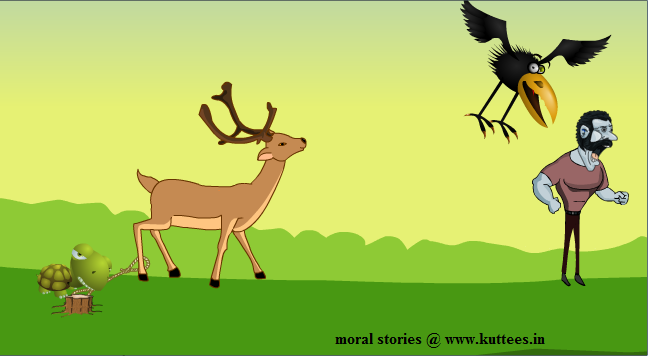 Once upon a time, a crow, a deer and a turtle were very close friends and they were always united and lived happily. One day, a bad hunter placed a trap near the pond in that forest to catch the deer. Not knowing about the trap, the poor deer stepped the trap and was caught in it. The other friends were shocked to see what had happened. Immediately, the turtle thought about a plan. He told the crow, "Don't worry friends. I can bite this rope and make our friend free in sometimes. Meanwhile if that hunter comes, you should try to chase him away for sometimes." The crow was happy to execute the idea. The turtle began to bite the rope. Sometimes later, the hunter came back thinking that he could get some big deer for that day. The crow immediately flew towards him and tried to hit his head. The hunter was terrified to see a crow trying to hurt him. He immediately ran away from that place to escape. Meanwhile, the turtle had completely removed the trap and set his friend free. All the friends that moved away from that place.